When you bet (or call a bet) you are, of course, trying to win the money that is already in the pot. How often do you have to win to make this profitable? Clearly not every time - if it costs you 10 to bet (or call) and there is 100 in the pot, then you'd be able to be wrong 9 times out of 10 and still break even. This is the essence of the pot odds: You're paying a fraction to win a larger sum. If you're more likely to win than you have to pay, then your bet/call is a winning move in the long run. It means that if there's only $30 in the pot and you have to pay $10 to win it, you'll lose on average a little over $2 every time you do it. Not a good thing. What if the pot was $50? Here, you average $1 profit for every call you make. Understanding the concept of pot odds is essential in order to play winning poker. Poker - especially limit poker - is taking a relatively small edge and repeating it relentlessly, over and over again, and making a profit from it. Making plays that don't pay off in the long run will instead turn that profit into a loss. Having said that, let's look at that first calculation again. Is it really a $2.17 loss? Always? Well, that depends a whole lot on what happens after you actually hit the flush. And this moves us into the next concept: Poker & Implied Odds. Where pot odds take into consideration the money that's in the pot right now, implied odds is an estimation on how much money you CAN win from the bet if you hit one of your outs. For instance, with 100 in the pot, and a bet of 20, is your gain really only 100 if you win? Can you really not squeeze out an extra few bucks from your opponent if you hit your flush? You probably can - and so as the pot will get bigger, your implied odds go up. A good example of when implied odds in poker come into play is when you limp in with a small or medium pair before the flop in hold 'em. Your chance of hitting a set (which is typically the only way a small or medium pair will win) is around 7.5-1, which means that pot needs to have 6 or 7 other limpers to make it worthwhile. But, of course, that's presuming that everyone will fold if you hit your set, which is rarely the case. Let's say instead that you get four other limpers and your bets will narrow the field down by 50% on the flop, and another 50% on the turn - what are your implied odds? Here, you stand to win 8 small bets, at the initial price of 1, which gives your call positive expectation. By this count, your implied odds are good to make this pre-flop call with a weak pair because of the money you'll figure to win if you do hit your set, rather than the amount you're "guaranteed" to win. Here's the downside to implied odds in poker though: They're an estimation, and as it so happens, people tend to be way too optimistic in calculating them. Gives you 9 outs to a flush, which is a 4-1 shot. Now let's say that there were only two of you in the pot, one limper and you in the BB. Flop was checked around, and he bet at the turn after you checked, the pot would be about 2BB. You're paying 2-1 to see the last card, which could give you the nut flush - but do you call? Pot odds say no. Implied odds likely don't give you the numbers you're looking for either, but this is where people get overoptimistic! JOIN OVER 276,178 OTHER PLAYERS WHO HAVE BECOME MEMBERS OF THE CARDSCHAT FORUM TO IMPROVE YOUR GAME AND PARTICIPATE IN EXCLUSIVE EVENTS WITH OTHER MEMBERS. LETS TALK POKER! SIGN ME UP! 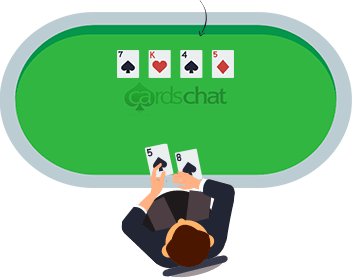 If your opponent paired his ace and has no hearts, would he really bet into a four-suited board after the river? Would he call your bet? Probably not. You can hardly figure to win more than the money that's already in the pot at the turn, because if you make your hand on the river, he's not going to pay you enough. Even if he calls an extra bet on the river (maybe he has the J♥), you're still not getting good enough odds. At that point, your call on the turn will have cost you 1BB, and you're looking at a profit of 3BB, which gives you 3-1. You'll have to successfully checkraise him (and he has to call your checkraise) for it to be near profitable, and you have to succeed at that every time that you hit your flush. Hardly likely. I know some players who think this is mathematical mumbo-jumbo and has no place in a gambler's heart, but this is really the principle that separates winning players from losing players: Being able to tell a profitable bet from a non-profitable one. In the example above, there's a non-profitable bet being offered. Don't take it. Learn your poker pot odds and implied odds thoroughly so you know which choice is the right choice. What are Implied Odds in poker? Implied Odds describe how much you may win on future hands based on the amount you need to make the next bet. Using Implied Odds is a way of figuring out whether placing the next bet against your opponent is a good idea or not. Calculating an Implied Odd in poker works in the same way as calculating Pot Odds, but Implied Odds take into consideration any estimated future betting. What does Pot Odds in poker mean? Pot Odds are the ratio of the current size of the pot, or winnings, to the cost of a call. For example, if there is $5 in the pot and your opponent bets $1, this will mean that you′ll have to play one sixth of the pot. Only then will you gain the chance to win it. What does Fold Equity mean? Fold equity = likelihood that opponent will fold x gain in equity if opponent folds. Implied Probability is an extension of Implied Odds. It is a conversion of traditional odds, in a ratio format, into a percentage. There are two ways to calculate Pot Odds, via the ratio method or via the percentage method. The most popular one to use is the ratio method. For this you first have to calculate the Card Odds, so this means figuring out which card you need and seeing what the likelihood is of it appearing on the next turn. So, find the ratio of cards in the deck that you don’t need against the card that you do need. Then, you′ll have to compare this ratio with Pot Odds. Using the size of the pot and the size of the bet, you can work out the Pot Odds. If the Pot Odds are bigger than the Card Odds, then it′s a good idea to call. What is EV in poker? Expected Value, or EV, is used to describe the average outcome of a situation when the situation depends on an uncertain event. In other words, EV refers to the average amount of money you could win or lose. You can have a positive EV or a negative EV. Also see our Poker Odds Calculator.